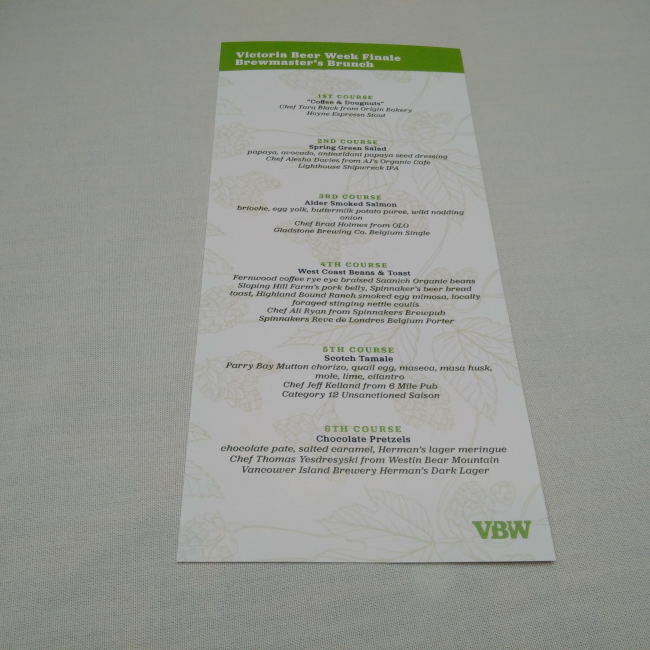 One of the events that I was looking forward to the most at Victoria Beer Week was the Brewmaster’s Brunch on Sunday March 15th, 2015. I had heard some great things about this event from the year before. 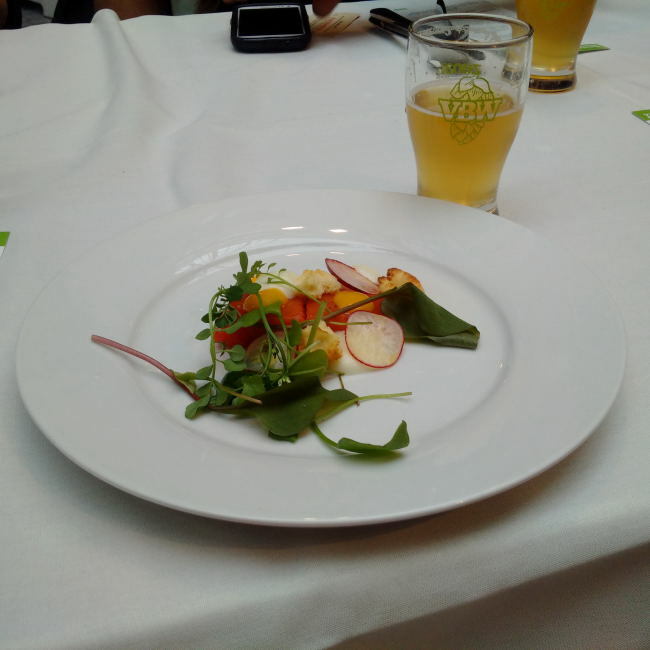 The premise was to pair 6 different 4oz pours of beer with 6 different food courses. Seeing as I had to drive soon after this event I had to keep to just the 6 samples as it came out to 2 12oz glasses or just over a pint. If you were not driving they would serve you full glasses of the beer on offer with the one rule that all of the 4oz samples of each beer had to be poured before they would serve full glasses. Full glasses were at an extra cost. 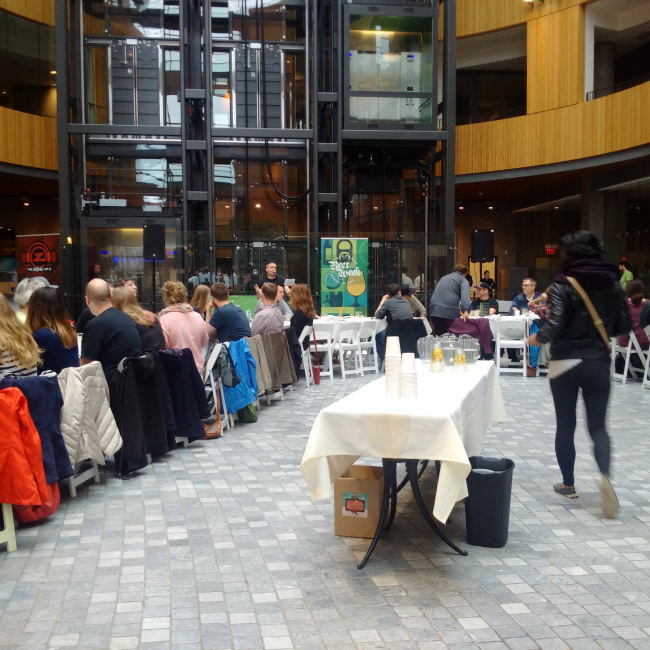 The event took place at The Atrium building in downtown Victoria. I find it amazing that this great location could be used as almost every tenant is a government organization. At each place setting along the tables that snaked all over the room you could find a menu of all the food and beer that were to be enjoyed. As you arrived you were handed the first sample of beer which happened to be Hoyne Brewing’s Voltage Espresso Stout. 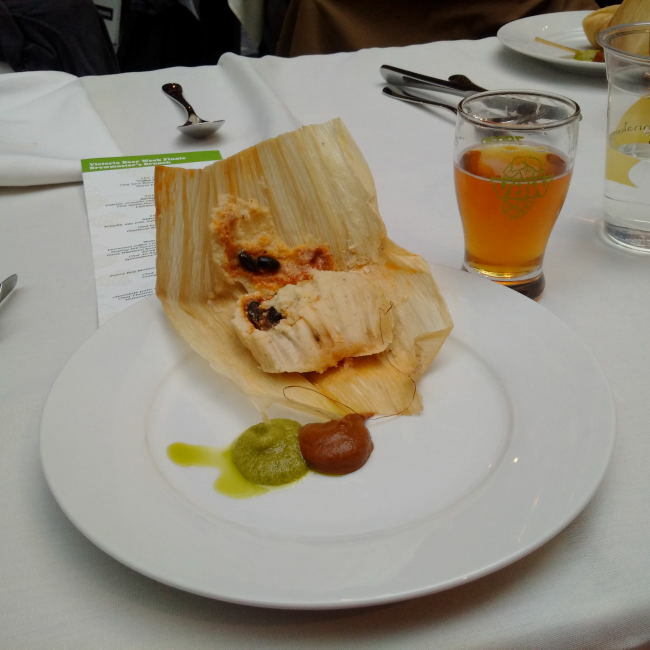 Once in the doors you had to remember to not drink all your beer right away as it was to be paired with the first course. With that in mind I found a seat. I did move fairly quickly though as I was invited to sit with the Owner of West Coast Brewery Tours Elton invited me to sit with him and his Fiance (or Wife my bad I can’t remember). Once the majority of people were seated the first course started to be served. 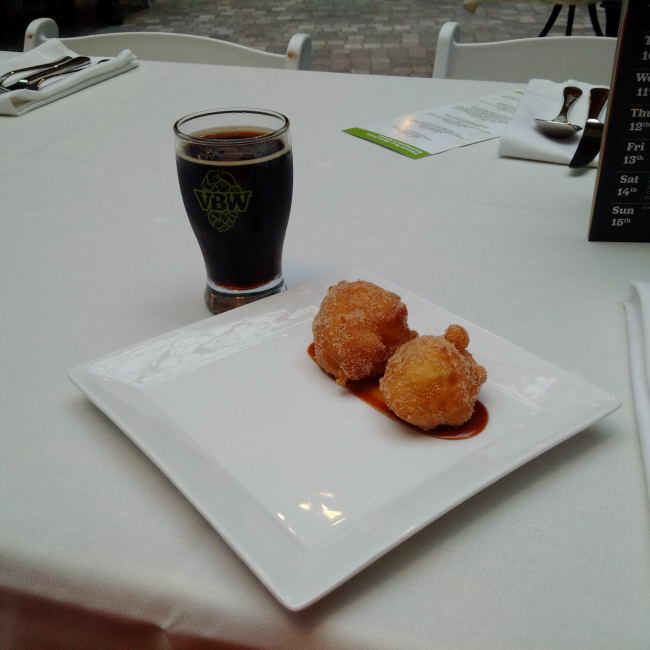 The espresso flavour in the beer really cut down on the sweetness of the doughnuts. Although the sweetness cuts though on some of the bitterness from the coffee also. Come on who doesn’t like some espresso with their early morning (or late morning after cask fest) breakfast sweets? While we enjoyed this course Tara Black and Sean Hoyne got up to discuss the pairings. 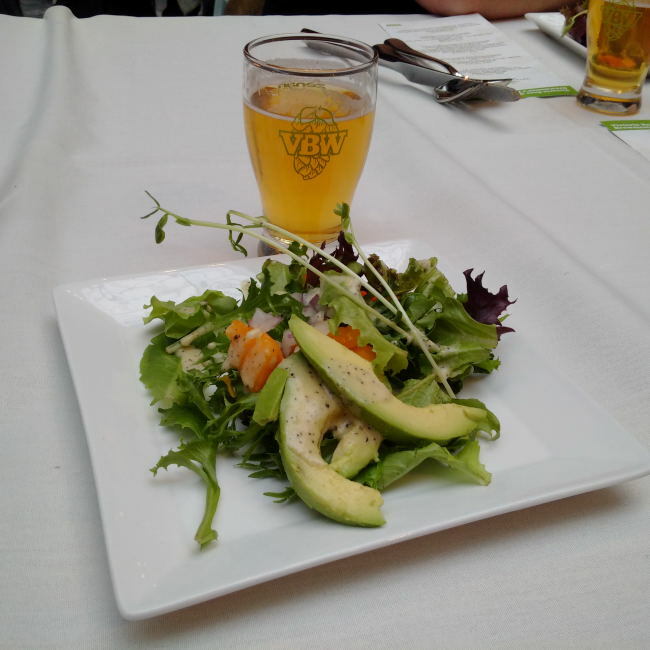 You probably can not go wrong with pairing a very tropical fruity IPA with a fruity salad in my books. Because of the fruit in the salad I found that the sweetness overtook the bitterness of the IPA fairly well and even seemed to please the group of people beside me that hated IPA’s. This was a tasty dish and was a hit from everyone around me. I found the salmon to be a bit salty for my liking but don’t listen to me as I am very picky with my Sea Food and only like fish as it is. The Belgian single is a style we need to see more of. It is quite tasty although light with lots of yeasty notes like you would expect with a very low alcohol content. Good on Gladstone for bringing out one of these beers that seem to be almost non-existent in Canada. We had more speakers but I can not remember who they were but I would assume it was Brad Holmes of OLO and someone from Gladstone Brewing. At this half way point Joe Wiebe the Thirsty Writer author of Craft Beer Revolution got up and spoke about how well Victoria Beer Week had gone on its second Annual event. Seeing as it was a smashing success once again it was a very upbeat talk. 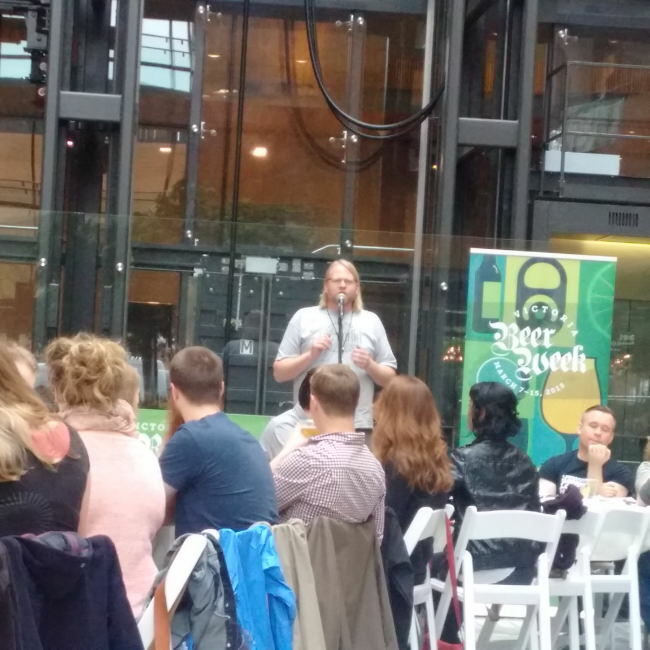 He did mention that all of the organizers would need some rest after pulling Victoria Beer Week off. Fernwood coffee rye eye braised saanich organic beans, Sloping Hill Farm’s pork belly, Spinnaker’s beer bread toast, Highland Bound Ranch smoked egg mimosa, locally foraged stinging nettle coulis by Chef Ali Ryan from Spinnakers Brewpub. Seeing as this beer was a collaboration between Spinnakers Brewpubs brewery and kitchen you know it would be good. The food was amazing and my favourite course with great beans and minimal pork. Do not ask me why the Chocolaty mildly fruity porter worked but it really did! Once we got our plates Chef Ali Ryan and Kala Hadfield got up and talked about the pairing. 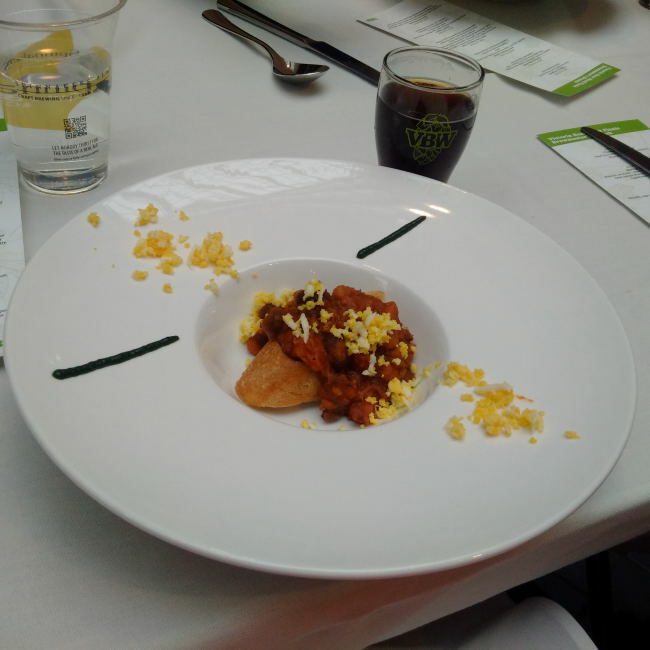 Parry Bay Mutton chorizo, quail egg, maseca, masa husk, mole, lime, cilantro by Chef Kelland from 6 Mile Pub. This course I was sadly was not big on. It seemed to lack in flavour and was a bit doughy. The very mild spice did build a bit with the saison which was nice. 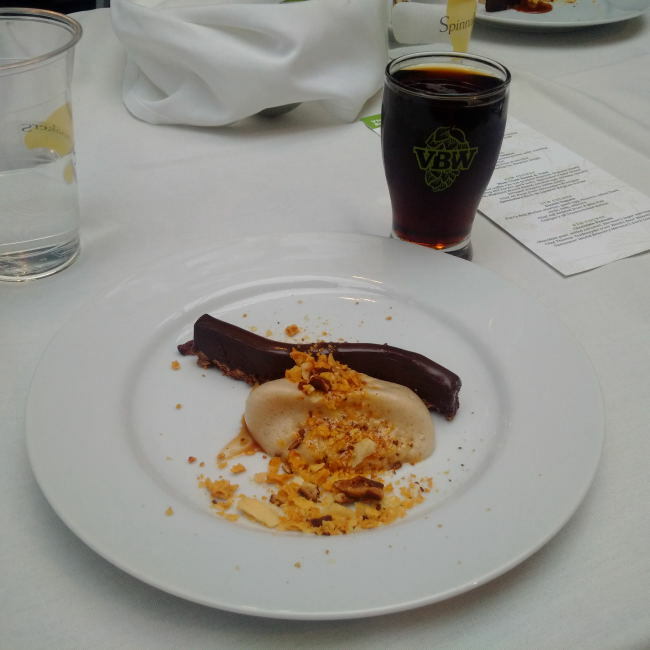 chocolate pate, salted caramel, Herman’s lager meringue by Chef Thomas Yesdresyski from the Westin Bear Mountain. The Herman’s Lager meringue was to die for being nice and frothy. 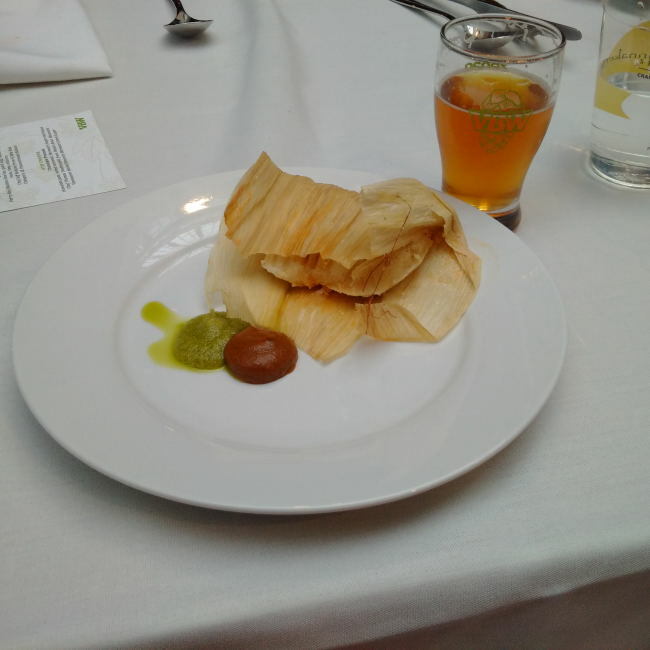 The chocolate and pretzel where great tasting and went well with the roasted malts and chocolate flavours of the beer. Not only was this a great brunch but the company was great also! If this bunch and the whole Victoria Beer Week says anything about what next years festival will be like then you should be very excited! 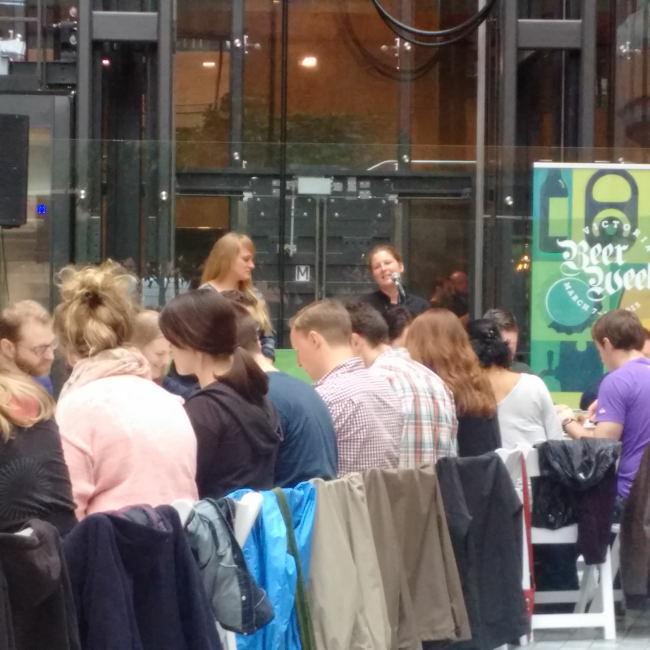 One other exciting part of this brunch event is that there was a pop up liquor store. With the new changes to the liquor laws some of the changes have been very beneficial to the average consumer (Not most but some!). Spinnakers has a line of liquor stores on the island and they were the group that decided to set up the pop up store at this event. At this store basically every Victoria brewery was sold as well as a few others including Salt Spring Island Ales. This entry was posted in Beer Travel, Tasting Event and tagged 6 course brunch, 6 courses, 6 Mile Pub, AJ's organic cafe, alder smoked salmon, bc, Belgium Single, brewmaster's brunch, brunch, canada, category 12 brewing, chocolate pretzels, craft beer, doughnuts, dougnut, Gladstone Brewing, herman's dark lager, Hoyne, lighthouse brewing, liquor store, OLO Restaurant, origin bakery, pop up liquor store, scotch tamale, shipwreck india pale ale, shipwreck ipa, six course brunch, six courses, spinnakers brewpub, spring green salad, unsanctioned saison, vancouver island, vancouver island brewery, victoria, victoria beer week, voltage espresso stout, west coast beans & toast, westin bear mountain.